A vast and little-known swathe of western Nepal, Dolpo is a magical region of frozen desert, piercing blue skies and unnamed peaks. There are hidden monasteries stashed with treasures, yak caravans passing along the old salt trade routes to Tibet, high passes where the air is so thin it pierces the lungs, snow leopard tracks, and stone walled villages seeming to blend into the mountain slopes. Here time is measured by the ripening of crops and the arrival of the first snows. You won’t find any trekking lodges, apple pies or crowded passes, but you will find scenery to make you gasp, and people welcoming you with open arms. There are, however, a few things to remember. Getting there, nearly always by small twin-prop plane, is difficult, expensive and unreliable. Most of the walks are demanding, long and high with no creature comforts, and most of the walks that follow must be undertaken with an organised camping group. Lastly, permits are complicated and expensive to obtain. But if you have the stamina, patience and finances, Dolpo will leave you enchanted. An idea as much as a place, the mythical Shey Gompa and nearby Crystal Mountain became a part of Himalayan folklore for many westerners after Peter Matthiessen wrote so lyrically about it in his book, The Snow Leopard. The monastery and its treasures remain remote, hidden behind the furthest Himalayan peaks, like some Shangri-La. Nepal’s most beautiful lake (and that’s saying something) is surrounded by pine forests and its shores are dotted with Bön monasteries (the original religion of much of highland Nepal, which predates Buddhism) and buzzing with wildlife. Everest’s Three Passes trek too mellow for you? The loop around Dhaulagiri (8,167m) makes any other trek in Nepal seem like a stroll in the park. The highlights are crossing the frozen French Pass (5,360m) and admiring the superlative mountain views from the bleak Hidden Valley. But take note: This is one tough trek, much of it borderline mountaineering. Time has stood still in this valley. Its villages, ochre and white gompas and monasteries are all reminiscent of the Tibet of yesteryear. And when you watch a mule caravan laden with goods from over the northern border descend from the high passes you’ll realise that you’re in a very special corner of Nepal. Perhaps no other region in Nepal offers such scope for wild adventure as Dolpo. Few foreigners walk the trails here and in many cases there’s still a sense of blazing your own routes – especially when undertaking the epic month-long walk from Dolpo to Jomsom (or Upper Mustang) along the roof of Nepal. Meeting the locals of Dolpo is as much an adventure as straining your lungs to cross the high passes. It’s a real ethnic and religious puzzle out here: One valley will be traditional Tibetan Buddhist; the next, ancient Bön, and some of the lower southern villages will be Hindu. This short and sweet trek follows the Suli Gaad River through pristine forest to the beautiful Phoksumdo Lake. It is 4.8 km long, 1.8km wide and, at over 600m deep, the deepest lake in Nepal. Being a national park, it is rich in wildlife. Many of the villages here follow the ancient Bön religion, and villagers and the monks at the monasteries will be happy to explain how it differs from Buddhism. The trek to the lake is a short one – five to six days on a straight there and back route. But there are plenty of opportunities to combine this trek with others. The two most popular are either over to the Do Tarap valley or, if you can afford the expensive restricted area permit, up to the legendary Shey Gompa. Trek Duration: 3 days to the lakes. 5-6 days return. The most popular trek in the Dolpo region – although often you’ll be the only trekker on the trail – the Do Tarap Loop avoids the pricey restricted area permits of other areas, but the scenery and sense of wonder is no less rewarding. The walk begins in forested country along the narrow Thulo Bheri Valley and meanders up to the remote Tarap Valley with its beautiful monasteries and old villages of pure Tibetan culture. Most people pause for a day or two in the valley before walking for three inspiring days over high passes (Numa La, 5,290m and Baga La, 5,170m) and through wilderness to arrive at the forested shores of Phoksumdo Lake. From here follow the return leg of the Phoksumdo Lake trek back to the airstrip at Juphal. If you have the correct permits it’s possible to head north from either the Tarap Valley or Phoksumdo Lake to Inner Dolpo and Shey Gompa. The walk times below are a minimum. This is one region where it really pays to allow extra days for side trips and explorations (and unreliable flights). Trek Duration: 10 days to Phoksumdo Lake and 12 days for the full loop. Before Peter Matthiessen wrote so lyrically about his journey to Shey Gompa in The Snow Leopard, this was a little-known area. Even now, high permit costs (US $500 per person) and difficult access keep visitor numbers down. But for those willing to pay, the incredible trek to Shey Gompa over the Sehu La (5,160m) from Phoksumdo Lake, or the longer and harder route from Do Tarap, are absolute wonders, taking you across yak herding country and into a Tibetan-influenced world that has almost ceased to exist anywhere else. You don’t get the same massive mountain views that you do on treks further east in Nepal, but the high desert scenery is still out of this world. The standard route to Shey Gompa is a six-day straight line hike from Juphal to Phoksumdo Lake and on over the Sehu La to Shey Gompa. For the return, there’s a choice of tempting routes. You can either return the way you came, in which case the entire trek can be completed in 13-14 days with a couple of rest days. But it’s far better either to loop across to Do Tarap via one of a couple of different routes (allow 18 days at least), or, even better, take the exploratory high route over the roof of Nepal to Jomsom or even Upper Mustang (see below). You’ll need at least three weeks for the Juphal to Jomsom route, and a month to Upper Mustang and then back down to Jomsom. Max. Elevation: 5,160m for standard route. Other routes go higher. You want adventure? Here it is: The epic three to four-week long Dolpo to Jomsom or Upper Mustang trek. Starting from the airstrip at Juphal head north to Phoksumdo Lake (you can also go via Do Tarap), over the Sehu La (5,160m) to Shey Gompa and then east, up and over several massive 5,000m-plus passes, through desolate high-altitude desert. The only other people you’ll meet will be the occasional herder with his flocks, or a yak caravan and trader returning from Tibet. There are one or two tiny villages along the way. Almost completely cut off from the rest of the world, this is a fascinating insight into old Tibetan culture. There’s no set route and any company offering this trek will largely create their own. Make sure they have guides who know the area. The route to Jomsom takes you into the shadow of mighty Dhaulagiri and is the slightly shorter walk (three weeks all in). It also doesn’t require quite as many restricted area permits, which makes it a little cheaper. The more rewarding route though would take you up along the border of Tibet to Lo Manthang in Upper Mustang, and from there back down to Jomsom. Allow a month for this walk. You will need the Inner Dolpo and the Upper Mustang permits. 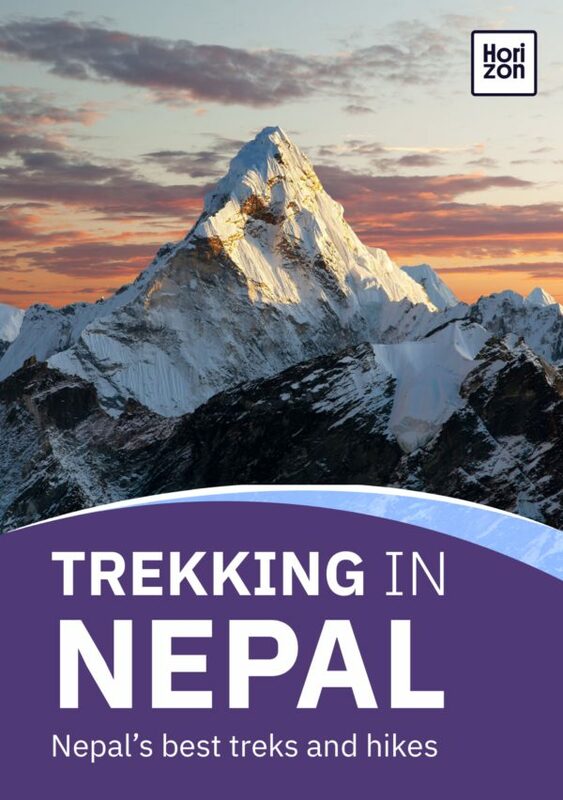 This trek is a true expedition and should not be attempted by inexperienced trekkers. Most Dolpo trekkers fly in to Juphal, but for a more relaxed and rewarding arrival in the region, the offbeat Beni to Dolpo trek is hard to beat. This starts in the green, fertile farmland and forests around the busy town of Beni which is a short bus ride west of Pokhara. After crossing several passes draped in prayer flags, it finishes at the edge of Outer Dolpo. Along the way you will pass through Alpine meadows, rhododendron forests and a mixed bag of villages of differing ethnicities and religious leanings. Road construction is eating into this area and although the trek traditionally starts from Beni, it’s now possible to carry on up the snaking road to at least Darbang or even a little further. This would knock a day or two off the standard 12 days. An alternative, and again rarely trekked, route in or out of Dolpo is from the Jumla airstrip to Dunai, from where you can join the Do Tarap trek or continue down to Beni. While there are no face-to-face encounters with huge mountains and no especially high passes to negotiate, this trek rewards with flower-filled valleys, friendly villages and shady forests with exotic wildlife. If you want to add a challenge and you’re aiming for Phoksumdo Lake, you can detour off the main trail and clamber over the frigid and bleak Kagmara La (5,115m). Dhaulagiri is the seventh highest mountain on the planet (8,167m) and this extraordinary and very challenging circuit around it, is one of the unsung mountain wonders of Nepal. This is not a trek for the average person. Two very tough weeks await anyone taking on the Dhaulagiri Circuit with several nights camping on ice and snow at over 5,000m. The French Col (5,360m) and Dhampus Pass (5,240m) are the official highpoints of the trek, but many people also attempt to summit Dhampus Peak (6,060m). Anyone attempting this trek should have lots of high-altitude trekking experience, and some mountaineering experience would be useful too. Be prepared to use crampons, ropes and ice-axes. Permit requirements for the Dolpo region can be quite complicated and costly to obtain, and all trekkers here need a TIMS card. The Phoksumdo Lake and Do Tarap treks require a Lower Dolpo Restricted Area Permit, and a Shey Phoksumdo National Park permit. The Beni to Dolpo trek requires a Dhorpatan Hunting Reserve permit. The Jumla to Dunai trek doesn’t need any permits. The Dhalulagiri Circuit requires an Annapurna Conservation Area permit. The Shey Gompa & Inner Dolpo and the Dolpo to Jomsom or Upper Mustang treks require much more paperwork and cost a lot more. Both require the Lower Dolpo Restricted Area permit, a Shey Phoksumdo National Park permit, and an Inner Dolpo Restricted Area permit (US $500 for 10 days and US $50 per day for additional days). The Dolpo to Jomsom trek also requires an Annapurna Conservation Area permit and the Upper Mustang trek also needs an Upper Mustang Restricted Area permit (US $500 for 10 days and US $50 per day for additional days). With any of the treks requiring a restricted area permit you must be in a party of at least two trekkers and be accompanied by a guide. However, it’s possible to pay for a second “ghost” trekker permit. Most of this region lies within the Himalayan rain shadow and all these treks are best tackled between May and October. The Jumla to Dunai trek can be walked from late March. The Dhalugiri Circuit is best in April/May, and September/October. Even though much of this region is a desert and rainfall is sparse it’s still best to avoid the July/August period as some rain does make it over to the far side of the Himalayas. Keep in mind that flights to Dolpo’s airstrips are frequently cancelled due to bad weather on the windward side of the mountains. From November to April most routes will be snowed in and villages sparsely populated. Although there are a few very basic homestays along the Phoksumdo Lake route and in the Tarap valley, all these treks are essentially camping only. Make sure that any agency you use has a working knowledge of the area and the trails. This is especially important on the Dolpo to Jomsom or Upper Mustang trek, and the Dhalugiri Circuit. Small planes fly from Nepalganj to Jumla and Juphal. There are frequent cancellations due to bad weather so give yourself a day or two leeway for flight delays. There are frequent buses from Pokhara to Beni for the Beni to Dolpo trek and the Dhalugiri Circuit. For now there’s no road access to any of the other trailheads, but that could change as road construction continues apace.